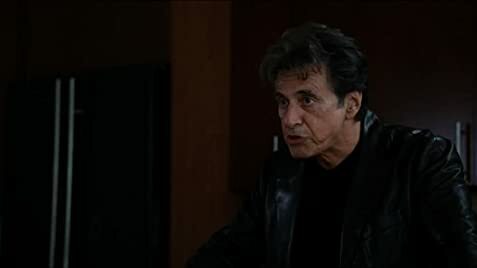 Righteous Kill is a kind of prototypical modern cop thriller that has the intonations of a neo-noir mixed in with some iconic figures. The script, in a way, is much better than I might have thought, and the actors- stars Robert De Niro and Al Pacino, in a film technically for the third time and for the first time technically in the frame for more than a few seconds (a pressure obviously from those who whined about their bit at the diner in Heat) as well as the likes of Brian Denehey and Carla Gugino- do their best to make it an entertaining ride. And for all of its recycled elements and plot turns and tough-guy take-no-s*** dialog, it's a fun ride for what it's worth as far as substance goes. You want to see what will happen with these two veteran cop characters as they delve deeper into this killer case (somewhat ripped off from Magnum Force, or something like that in terms of the victims), and what the "twist" will ultimately be. For those who might think it tired or stiff, I wouldn't put any real blame on the stars, or even Gerwitz's (flawed) screenplay, which does occasionally pull off dark and funny banter and some coarse dialog and action and thrills to the degree that one saw in his Inside Man script. The problem mostly was the direction; Jon Avnet is not a visionary, nor is he a really well-suited neo-noir director. He's just a competent technician (if not veerying close to outright hack) enough to dig up a few potent bits or visual touches, and mostly tries to make the film "hip" and "fresh" and "inventive" with the approach to style in the flashbacks, and he doesn't possibly bypass the pitgalls in Gerwitz's script. What is pleasing, ultimately, about the picture is that it's not bad at all, and is actually a good movie. But with characters played by near generational icons dubbed in the film as "like Lennon and McCartney", this isn't quite up to their previous snuff together. They deserve just a little better with the likes of Godfather 2 and Heat to their previous collaborations. Overture Films paid a little over twelve million dollars for the American distribution rights, beating out Warner Brothers Pictures and Universal Pictures, who also put in bids of over ten million dollars. Rooster: One, between the eye! Turk: Two, between the eye! When Turk and Rooster are in the church (near the beginning after the weapon has been planted) the harsh key light (sun ray from window) comes from stage right. When they cut to the close up it comes from stage left. After the credits, the sound of a train is heard.